On November 4, 2017, over 150 people, including the members of 37 families participating in the CHILD Study, braved a Winnipeg snowstorm to celebrate a Study milestone: the completion of all five-year clinical visits. CHILD has been following some 3500 children and their families, across four Canadian locations including Manitoba, from pregnancy onward, collecting a vast array of information by questionnaire and through clinical visits with the children at key time-points during their growth and development. Even the youngest of the children in the Study have now turned five years old—the eldest are on the brink of their eighth birthday—and all have completed their fifth-year clinical visits. As the originally planned end-point for the Study, this marks a significant achievement. 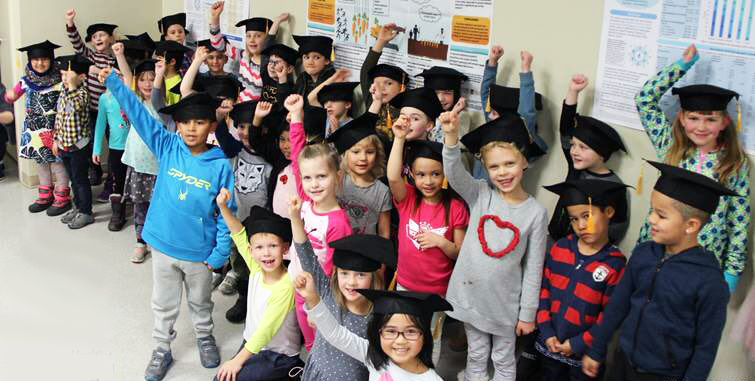 “We wanted to hold an event for our CHILD participants to celebrate the end of the five-year assessments and to give them feedback on CHILD study discoveries,” explains the Manitoba Site Research Coordinator, Phaedra Propp. The Study has extended its mandate to continue following its child participants to age eight and beyond.